Type species: Phrynosoma orbiculare Wiegmann, 1828 = Lacerta orbicularis Linnaeus, 1758, by subsequent designation by Fitzinger (1843: 17). Wiegmann, A.F.A. 1828. Beyträge zur Amphibienkunde (in German). Isis von Oken 21(4): 364–383. BHL Reference page. Montanucci, R.R. 2004. Geographic variation in Phrynosoma coronatum (Lacertilia, Phrynosomatidae): further evidence for a peninsular archipelago. Herpetologica 60(1): 117–139. Montanucci, R.R. 2015. A taxonomic revision of the Phrynosoma douglasii species complex (Squamata: Phrynosomatidae). Zootaxa 4015(1): 1–177. doi: 10.11646/zootaxa.4015.1.1. Preview (PDF). Reference page. Uetz, P. & Hallermann, J. 2019. 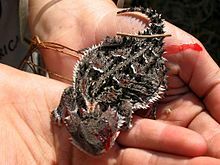 Phrynosoma . The Reptile Database. Accessed on 1 November 2018. For more multimedia, look at Phrynosoma on Wikimedia Commons. This page was last edited on 1 November 2018, at 23:06.